Bourne’s Cinderella is ultimately about two people looking for each other and peace during wartime. The Cinderella plot line is incidental character development. This interpretation takes place in 1940’s London, under the backdrop of the devastating Blitz. The ballet is set to, and inspired by, Prokofiev’s Cinderella, which he composed during World War II, and is forebodingly romantic. I’m a staunch believer that live music elevates any performance, but the orchestral recording conducted by Brett Morris combined with innovative use of surround-sound felt like the 82 piece orchestra was in the hall with us. Bourne cites the movie, A Matter of Life and Death (1946) as one of his inspirations in this adaptation, and this telling of Cinderella could more aptly be described as a mashup of the two (or even more) classic storylines. According to the Playbill, A Matter of Life and Death features a Royal Air Force Pilot who is guided between life and death after a plane crash by a male guardian angel. In Bourne’s production, Cinderella’s Prince is replaced by Harry, the Pilot, and the fairy godmother is replaced by a male Angel who guides Cinderella between fantasy and war torn reality. Cinderella, played by Ashley Shaw, is easily susceptible to the influence of Liam Mower’s Angel. Harry, played by Andrew Monaghan, is an injured Pilot struggling with physical and mental wounds. The Angel constantly facilitates the interactions between our two protagonists, and is more puppet master than benevolent enabler. The show opens in Cinderella’s home, where she is serving and cleaning up after her step mother, sisters, and brothers. This is really where the similarities to the classic fairytale end. Her father is still alive, yet confined to a wheelchair and without much agency (or contribution to the storyline). Act 2 is the quintessential Ball scene, yet, I’m still not sure if the entire Act was a dream or occurred in an alternate reality choreographed by the Angel. Unique to this telling, Act 3 has a heavy emphasis on Harry’s perspective as he searches for the owner of the slipper found in the rubble after an air raid. It’s a welcome addition that Harry recognizes Cinderella without her needing to try on the slipper. New Adventures is Bourne’s dance-theater company based in the UK. I watched New Adventures’ production of the Red Shoes last year during its Kennedy Center tour, and what sticks with me a year later is Bourne’s powerful storytelling in a medium that has no dialogue. Cinderella was no different, and between the powerful dancers and dramatic stage design, I was engrossed in the drama. While I have loved the two shows that I’ve seen by New Adventures, it’s a troupe that’s lacking in diversity, which is exacerbated by Cinderella’s transformation from dowdy brunette to elegant blonde for the Ball scene. This self-proclaimed Kennedy Center reporter recommends going to see Bourne’s Cinderella, but manage your expectations because this is no Disney fairytale. As my resident ballet expert, and Cinderella watching companion described it, there was no pas de deux bippity boppity boo. 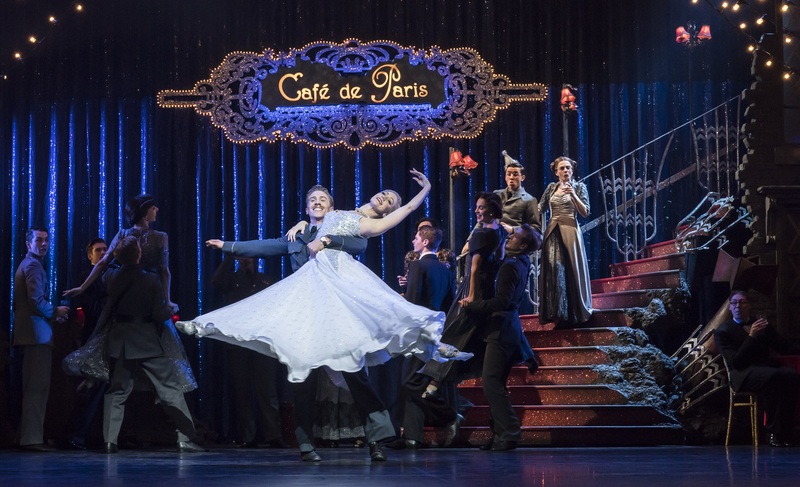 Matthew Bourne’s Cinderella will be playing at the Kennedy Center through Sunday, January 20 and you can get your tickets here. Hopefully the Kennedy Center continues to bring Matthew Bourne’s New Adventures back to DC, because each performance is evocative and compelling.